My good friend, Vladimir (Vlado) Karamitrov (N3CZ/ZS6MG) is someone who likes to challenge himself. Perhaps this is why he’s such an accomplished DXer and contester. 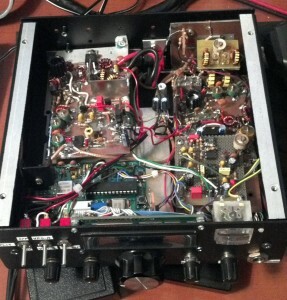 Recently, at his QTH, he showed me one of his latest projects: a home brewed QRP transceiver. 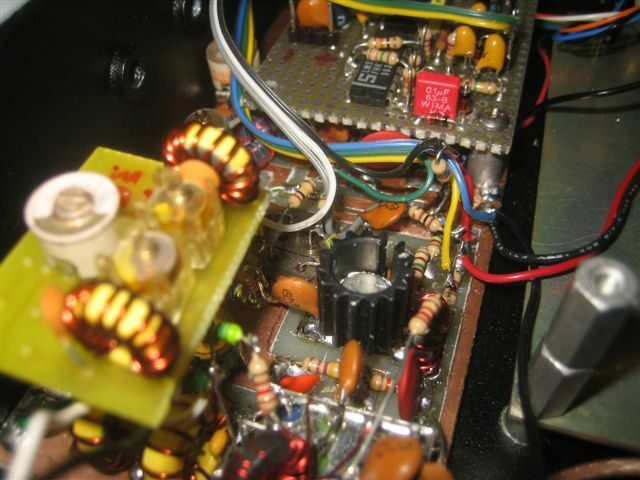 Vlado wasn’t content to simply build his own high-performance transceiver; no, he needed a built-in challenge. 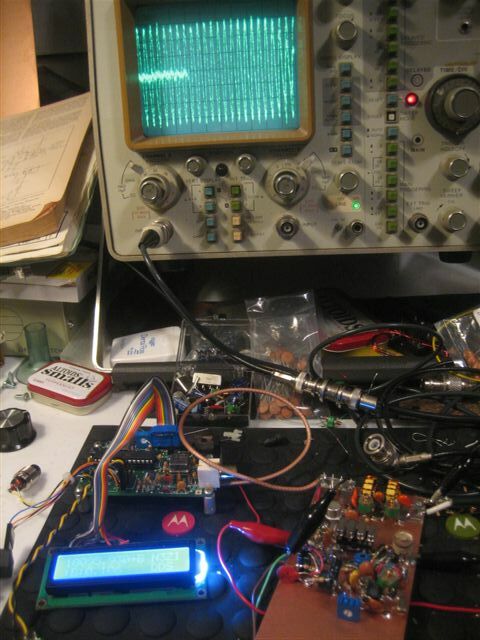 Building your own radio is a challenge on its own. Using it to work DXCC is another challenge, probably less difficult. But combining the two brings a new spark and joy in our hobby. Isn’t ham radio about radios? 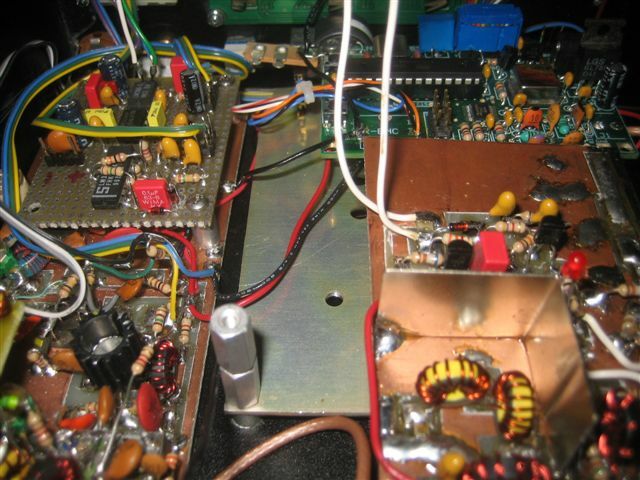 The purpose of this article is not to argue the need for building but to give ideas to those who have the time, like a new challenge and open up for ideas of building their own radios. There are many different aspects to look into this. One is to build a radio from a kit. A search online will provide a list of manufacturers who offer these kits from basic thru intermediate to advanced designs. The other approach is to build it your self. Yes, from scratch. Well, why not? Remember, time is what is needed most and of course some money and/or spare parts or junk parts. Time is not what I have available a lot, money is always on the agenda but having spare parts and stuff lying around your garage is another good resource. So I decided to put something together. No time –means I can’t spend a lot on making this new rig look like a factory made, I have to use dead-bug design techniques and other easy methods to “glue” everything together. Available time is only after work and weekends and that is not much. What kind a circuit and design to use? This was really the main question, because the answer will dictate what approach to take. First rule is check what parts and components you have available. There is something you have to remember here — when you go to a hamfest always bring some “junk” back home. You never know what you going to need. We all know this rule don’t we? Also don’t forget what your buddies have collected over the years, they will be able to help you with some of the missing parts if you need. One of my passions is building my own equipment. Starting from antennas, to control boxes to switch them, pre-amps for the low bands and from time to time build a small QRP rig. 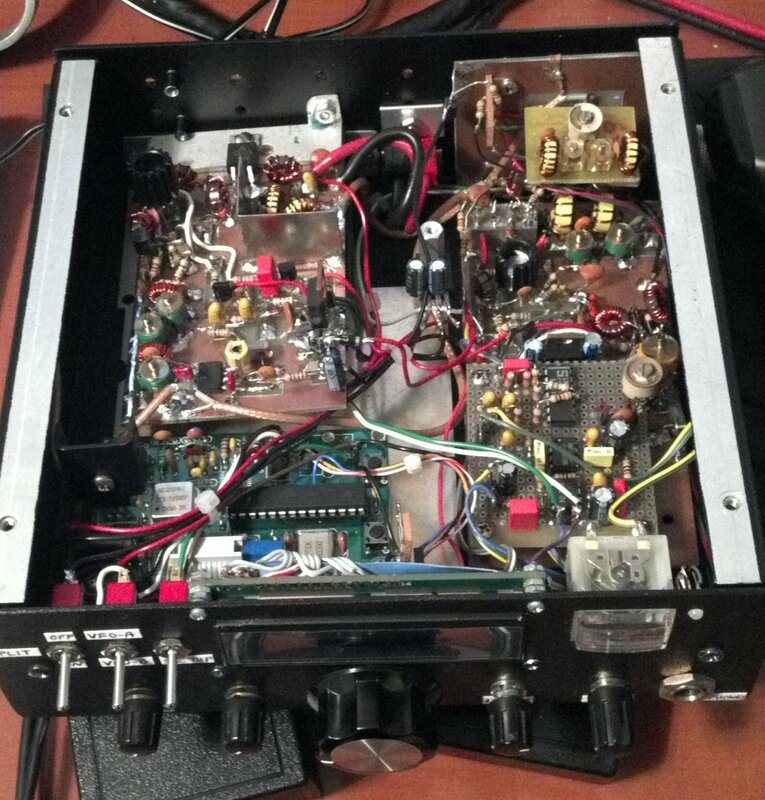 Other interests are DX and Contesting, so while putting this radio together I cannot wait to hook it up to my antenna. This is where a little patience is required and I had almost none, hi. But I knew, bands are down for now, I have worked almost everything that was there to work, so will do this one little different and try to slow down a bit. With my projects everything starts with the box. Few boxes I changed until the right one was in my hand. Next was to find a properly sized knob for the VFO. I then realized that it will take little more time to build all the components so I decided to use my $$ budget and get my self a nice DDS VFO. There are few different ones available online and for around $80. I got a nice programmable one with dual VFO’s and memories, with settable IF offset etc. This seemed to be the perfect fit for the project. You know the feeling – you feel a bit lazy at the beginning until that moment when that spark gets you. It’s like when you have to mow the lawn, and then you think, “no, it can wait another week, don’t feel like doing it now.” Well, I found my spark – it was not in the box, it was in the tuning knob that I got from a colleague also a ham and one who builds little QRP’s. I was actually explaining to him what I was planning to do, but not sure yet of the concept and how to handle certain parts of the circuit. While discussing all of this, he said he had some parts that he would bring for me and see if I could use some. He did not mention about any knobs, but when I saw them I knew I had what I was missing and now it iss the time to start working on this. Now that I have the heart and the body, and the knob, I did some study of a number of different circuits published in ham radio literature including ARRL’s handbook and many online QRP resources. 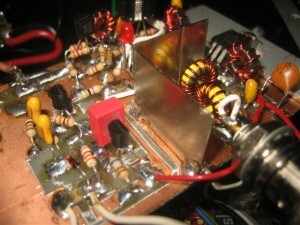 The goal was to build a simple radio easily reproducible, with reasonably good specifications so you can use it daily. Selection of IF frequency was the next and I decided on using 4MHz as I had access to a pile of some computer xtals of 4.032MHz. I was ready to take on my own challenge – build it and work 100 countries with it! Associated pictures with this article represent certain stages of the building process. As you can see I picked up an easy method for putting all together. I liked this approach for a simple reason that I can go step by step, keep adding components and test each stage as I move forward. There was no need for making PCB…who needs a PCB. In the old days, radios were built on a chassis and components hanging in the air and radio worked. On the other hand there was that perfection starring at me and making me feel a bit guilty, but I had no time to waste but hurry and build this radio in the short time I had available to me. 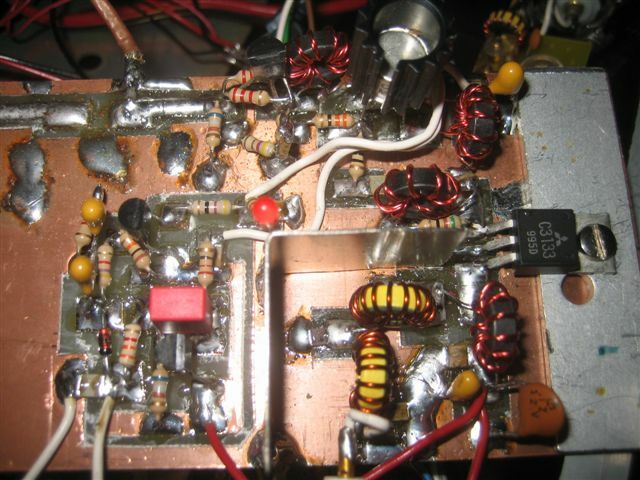 Because you know what, the bands will just open up again, and then I had to do my other part – the DXing, hi so I may not be able to get this done. I actually put the receiver in a working shape in one afternoon. I had the front end bandpass filter , double balanced mixed, post mixer amp, xtal filter, IF stage and audio section. All tested and worked first time. I spend the rest of the evening listening on 20m. Nothing much there but I found few stations up the band. There were few UA0’s as well. I managed to pick them up but signals were tiny. I decided to check my main radio and compare. 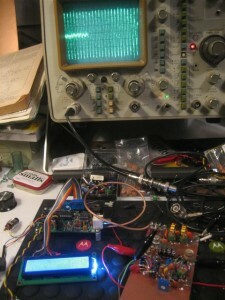 I see now…signals were stronger, much stronger, S9 + on my TS850. So I checked few things and found few problems with my initial design: I had to amplify the input signal and my LO signal was too low to produce satisfactory mixing with SBL1. 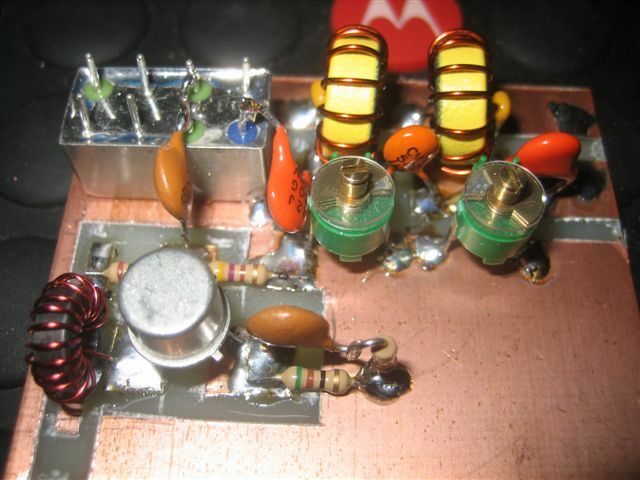 I used a J310 FET transistor for my front end pre-amp, and used single NPN transistor to boost the output of the DDS oscillator to appropriate level. I was ready to fire this thing and …wow, what a difference. I could still hear the UA0’s calling CQ and working others, and the signals were just incredible. Next obstacle was the Xtal filter. I had choose computer xtals that were somewhat matched in frequency, but the filter was way too narrow. I started experimenting with the capacitors around it and found a good medium that showed some good response on the signal quality and bandwidth. Received signals now sounded “almost” like my ‘850. But I wasn’t happy yet. I was missing some “dynamics” in the signal. It was just a plain CW signal and nothing more to it. 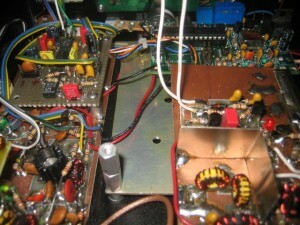 Next few days I experimented with an AGC circuit and variable bandwidth for the Xtal filter. After number of changes, I came up with a solid audio AGC circuit and S-Meter. That made a whole lot of difference. Everything was still sitting on the bench, loosely connected together and I was listening up and down the band. There were more stations now…hmm the bands must be opening up or something? For the xtals filter I ended up replacing the fixed caps with varicap diodes which I pulled out from an old TV tuner found at one of the local hamfests. You know that feeling when you can actually adjust xtal filter bandwidth. That is what was missing. I spend hours listening and trying to get into motion for my next step. I was simply amazed what I could pick up with the receiver and how I was able to select different signals, some of them very weak. I went back and forth between my main radio and this little receiver that was sitting in front of me, still in pieces. “Not much difference is it?”–I was thinking to myself. I actually ended up spending hours in this year’s CQ WPX CW contest and only listening on my new receiver. I was able to pick every signal I wanted, even thru some heavy pile ups. It passed the test! Now I wanted to call these all these stations, so it was time for me to start thinking about the transmitter part. This was nother challenge. I tried one circuit and it worked. Straight forward a TX mixer, bandpass filter, couple stages amplification, low pass filter to the antenna. But I could not get the output power I wanted. I was getting something like 1 W barely making it to 2W. I figured out the reason. It was the transistors I used. Each stage must have enough gain to drive the next one. 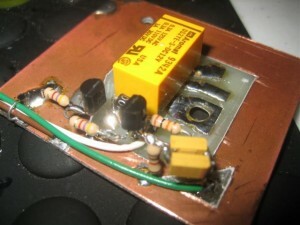 My final transistor was capable of producing an easy 10 watts out, but I was lacking drive power. 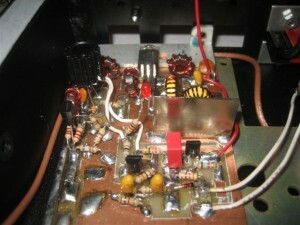 I checked the complete circuit and components I had available on hand then decided to make few changes. Remember: the goal was to use what was available and not to go and spend any extra money. I ended up adding extra amplification after the TX mixer. Yep! That was it. That is what I was missing. I was now getting an easy 8W out. I couldn’t wait to hook up the antenna. I had no antenna switching circuit yet, so I hooked up my 3 element SteppIR on the little transmitter and used my vertical antenna on the main radio. Nothing easier than this. I was able to hear my transmitted signal and, at the same time, I could listen on frequency. First call and into UR land…559, “not bad,” I though. I then moved up the band and found a French station ending up a QSO, so I called him and worked him too. I got 579 for my signal. This was getting exciting. I ended up working 10 different countries that evening, mostly Europeans. I spent the next week or so working on the box and figuring out how to implement the mechanical part of this project and get everything together. I tried using the little radio on 2 different bands (20 and 17M) with excellent results. These have been my main bands this year after they stabilized somewhat and we have them open after work until late. This is the perfect time for experimenting. Final touches can be seen on the rest of the pictures displayed here. I actually used this rig in the IARU CW contest for a while as well as in few QSO party’s on 20m, all with great success. The crown of everything was still to come. “should I try this little rig and see if maybe somehow they will hear me?” I wasn’t sure this was going to work, but I hooked up my memory keyer and started pushing the button to send my callsign out. I did this for almost 2 hours. Yes, there was nothing else to do, while I was reading a magazine, I just used the preprogrammed call sign and kept sending it over and over. 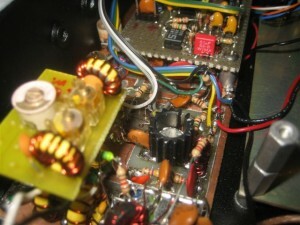 Then I heard Lynn W4NL working ST0R with his QRP rig…NO WAY! What is he doing differently then me? And I am going crazy and about to give up, but….I was careful enough to check what frequency was W4NL transmitting so I tune up a little higher then he was. 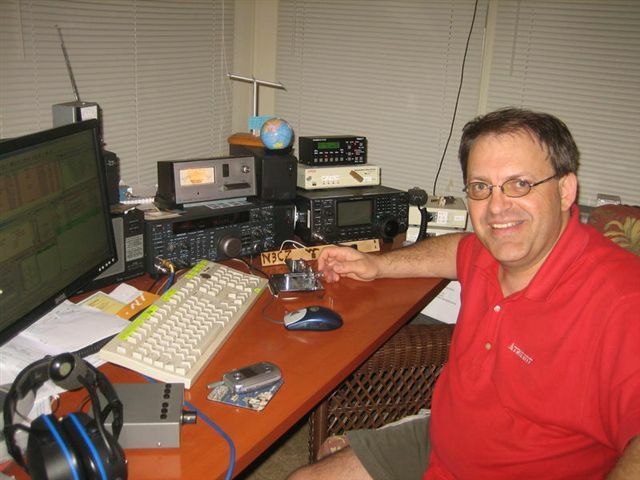 At the same time I received email from Lynn saying he worked ST0R QRP! Yes, I know I heard you Lynn…so I pressed few more time on the keyer. Guess what? It took couple more calls and there he was….smiling at me ST0R called me N3CZ 599 BK. There must have been another CZ I thought, so I send my call, then 599 and then my call again. Sure enough he came back with N3CZ TU. That was it! I did it! 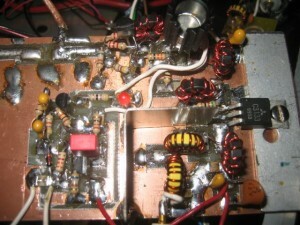 I just worked ST0R–a new country in a pile-up with my little homemade radio. I had them worked already on 20 CW , so what if it was a dupe? I knew I did it with my little radio and that was good enough for me. This is where I actually stopped and realized that I have accomplished my challenge. At least I have made it to a milestone, a major milestone. At that time I had well over 60 DXCC countries worked with the little radio, and it was barely 2 and a half months since I started working on this project. I found this encouraging and I would challenge those readers who are thinking about a similar endeavor to not think twice–just do it! Order yourself a kit at least and put it together. The reward cannot be described here or told by anyone. You have to feel it on your own. Put a challenge for yourself. Make a goal to work 10 states maybe or 10 DXCC countries, or 100. It doesn’t really matter. What matters most is that you give this hobby of ours another chance. A chance that makes it different from any other hobby on this beautiful planet we live on. What better can it be than communicating with others over a the vast emptiness of the space around us and bounce few signals now and then of the ionosphere? “DX RULES” as my good friend Bill N2WB from Florida say. I say “HAM RADIO RULES!” nourish it with everyday ideas, build your own stuff, don’t just buy that new radio and antenna, ready assembled and waiting for you to simply push few buttons and “work that rare DX”. There are many aspects of this hobby and like with anything in life we have to find it on our own. Sometimes we get help from another ham, sometimes a complete stranger to us, but with the same ideas. Thanks to Dave K4SV, Phil W9IXX, Lynn W4NL and Carl N4AA who insisted on getting this article done [originally for The DX Magazine]. And all the stations who logged N3CZ/QRP. That was me who called you with this little homebuilt-junk parts radio. Drop me a note if you find this interesting and inspiring, because that was my intention anyway. By the way, I am already gathering parts for my next project. This time it really started with a nice box, but we’ll see. I don’t see that spark yet. I will let you know how it goes. 73 & CU on the bands. And thank you, Vlado, for sharing this article for QRPer.com readers! To contact Vlado, grab his email from QRZ.com. 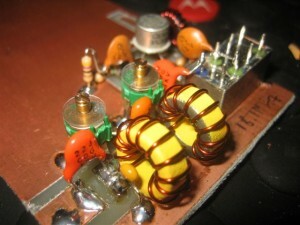 If you have a home-brew QRP project that you would like to share with QRPer.com readers, simply contact us or comment! 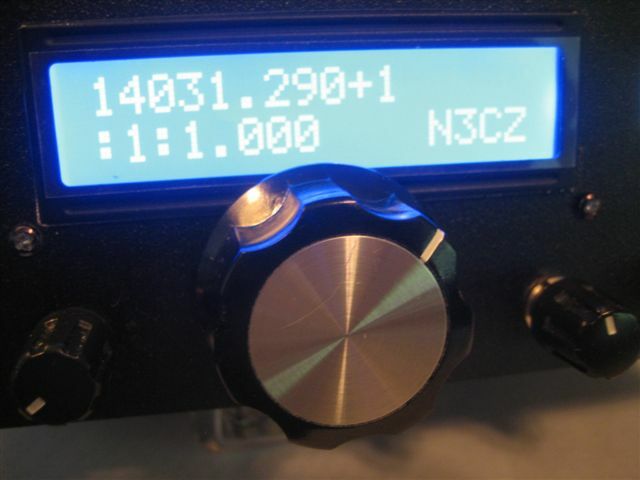 This entry was posted in Homebrew, Interviews, Portable, QRP, QRP Radios, QRPers and tagged Ham Radio, Ham Radio Home Brew, Ham Radio Homebrew, N3CZ, QRP Home Brew, QRP homebrew, Vlado. Bookmark the permalink. It’s in french, but all are welcome. Gosh, I enjoyed reading this! It looks like a wonderful rig. Thank you for sharing, Vlado, and I second your sentiments about the pleasure that comes from operating with homebrew gear. My thanks as well to Tom, K4SWL, for bringing this to my attention. Keep up the excellent work (er…play), Vlado. Thank you so much for writing this very motivating article!! Just when I was feeling like I had gone way over my head with my MacBook controlled QRP transceiver, my good friend AJ4MJ emailed me this article. I found my spark again!!! Thank you for a wonderfully inspiring article. I’m finally back in ham radio after 25 year lay off for my career. There is so much richness to explore and savor now. It’s great to find others out there building stuff. bravo vlado!!! pozdrav brat da si ziv i zdrav.